This is one fast communicator. You may have run into an individual with this aspect and they are easy to spot because they are wide awake, they move around quickly, talk fast and probably drive fast. These people have people to see and places to go. 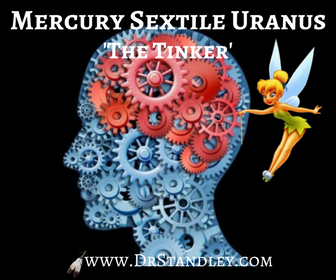 This is a fabulous aspect for an individual in sales because Mercury rules sales and Uranus is the higher octave of Mercury. The individual with this aspect is quick-witted, with a clever handle on how to use words. This aspect also bestows quick flashes of intuition and ideas. The mind is moving a mile a minute. Read more in my Astrology Aspects eBook - click the graphic below!